Thought I’d disappeared, gone to a kibbutz or started an underground urban gardening co-operative the last few years? Not really. Truth be told, I had a baby in Germany in mid – 2012 and spent eighteen months on maternity leave in Berlin. 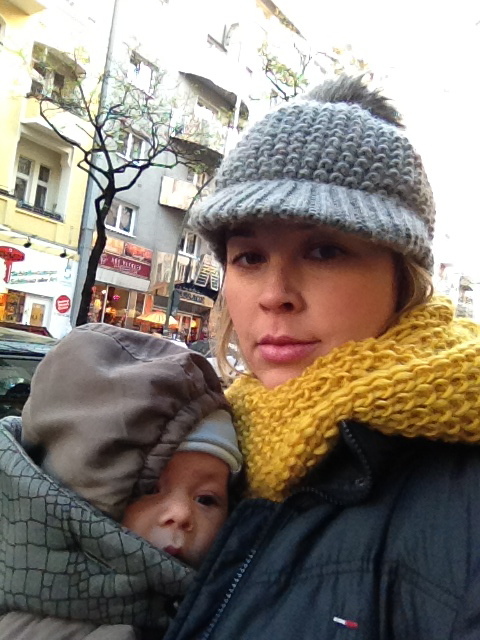 Reflections on the unpredictability of life as a new mum in Berlin and what happens post-maternity leave. Early morning, February 2014 and it was 7°C. I wiped the sleep out of my eye, still a little dream-muddled. Nervous diarrhoea was coming on, the pre-speech or pre-job interview type. There it was too – that indefinable guilt that had been gnawing away at me for months with my Bavarian sister in law’s voice faintly echoing in my head about children being happiest with their mother for the first three years of their life. Were we doing the right thing ? Would he feel neglected? Would I feel completely lost without him ? It was the first day of my son’s “Eingewöhnung” or settling in at his new Kita (pre-school) in Berlin. Eingewöhnung essentially means that one parent takes four weeks to be with their child to “settle” him or her in to their new pre-school. I volunteered to do it, more out of curiosity,after having heard friends’ stories befitting a twenty first century addendum to the Brothers Grimm fairytales about how good/bad/amazing/traumatic the whole experience was. The Eingewöhnung starts with 15-20 minutes on the first day where you, the parent, sit in the back corner of the playroom while your child interacts with his/her new childcare teacher alone. The rest of the kids in the group are not there. You are not allowed to intervene (unless of course your child is inconsolable). Then on the second or third day, a few kids from your child’s new group are introduced to your child, a calculated technique to make sure they don’t get completely overwhelmed. Then the time they spend there is gradually increased in the first week to about 1 hour per day, at which point at the end of the first week, you have your “first separation” for 5 minutes from your child (where you pretty much go and hide in the cleaning cupboard of the pre-school). In the second week, you do the same drill just that the daily interaction increases to about 1-2 hours per day and the separation time follows suit. In the first real 30 minutes of separation sometime during the second week where Noah was playing in the kita, in the care of his teachers, it suddenly dawned on me- this was the first time in my life my child was in the care of non-family members. We’d never used a babysitter having had the luxury of my lovely mother in law who used to take Noah for walks in the pram since he was a few months old a couple of times a week. By the end of the second week, I was dropping him off and he spent a few hours there alone and was even having lunch with the other kids. By the third week, we were trialling daily nap-time. At the end of the fourth week, he was more or less “eingewöhnt” (settled in) and spending at least 4 hours there per day. We had mulled on childcare options for a good year – we wanted a small day care, bilingual, with some kind of Montessori element, managed by parents*, not run as a business and close to home. Nannies aren’t in high demand in Berlin probably because of the incredibly generous childcare system and it wasn’t an option for us. Securing a childcare spot in Berlin is a full-time job in itself what with the endless ream of application forms, first and second round interviews and shameless psychophantism that accompanies the whole process. It is a job akin to that of a professional lobbyist at the UN charged with the near-impossible task of persuading the Security Council to agree to ban drones in warfare, rather than a humble,clueless new parent simply trying to secure a childcare spot for their child. I was close to forming a new start-up which would develop a new website modelled on LinkedIn- something like PoopedOn or SpewedOver – to showcase what all these 6 month old babies could do as we had to fill out yet another application form – language pedigree, social skills and “parent referrals”. Childcare in Berlin is the envy of the whole Bundesrepublic. There’s many more places available compared with other cities such as Hamburg and Munich, not just due to state-based politics but largely and inevitably, history.A quirky legacy of east Berlin and Socialist Germany childcare norms where mums and dads went to work and the state took care of their little ones, Berlin daycare is melded with a more modern Montessori approach. It’s affordable and in most cases free or with very low parent contributions which are means-tested, ranging anywhere from 100€- 400€ per month for 5 days of care with one warm meal a day and two snacks. My American and Anglo friends abroad constantly asked me “How much do you pay per day ?” already in the mindset of childcare being just another stock-listed corporation to invest shares in. When I told them our monthly rate, they were certain I was lying. No I’m not, I reassured them. None of my German friends have ever asked how much our childcare costs. Again, a subtle cultural difference where discussions about money and how much things cost are quasi taboo topics in Germany. Most daycares are privately run either for, or not-for profit, and can still qualify for government subsidies. The daughter of the CEO of Siemens and the son of a taxi driver technically have the same rights to a childcare spot at the same pre-school- you receive your “daily hours voucher” from the local council once they assess how many hours the child needs per day based on the parents’ employment status and their salary, and how much the parent contribution is. Unlike most parent-initiative daycares in Germany where parents have to cook meals every day and clean up, at our daycare, there is a Canadian chef who prepares the most delicious fresh food (brown rice with chinese vegetables, home made pizza, cauliflower gratin anyone ?) each day.They also have a German Civil Volunteer – those burly young German men who no longer have to do compulsory military service but have do to undertake some kind of volunteer social work for one year and their lovely cleaner. Little did we know that such a place existed right around the corner. When it came time to start Noah’s day-care settling in, in addition to the excitement I felt for his new start I was frustrated at myself. What had I been doing the last eighteen months I asked myself ? Why hadn’t I sorted out my life ? Where had the time gone? (Since arriving in Berlin in 2009, I had studied German full time for almost one year. I then took the self-employment path for two years before going on maternity leave in July 2012.) What about all the new writing work, applications for teaching and lecturing work and new communications projects I had planned (in my head) ? My work life, my goals, my ideas seemed nebulous. Freelancer didn’t sound so glamourous anymore. It seemed terrifying. A disorganised mum with a pasty northern German din, that’s what I was. Damn Apfelstrudel. Damn German winter. I had a few new articles I’d been commissioned to write and had signed a contract for a new lecturing gig in the Spring but beyond that nothing concrete. I had no office, no colleagues to come back to. No annoying boss. No familiar water cooler . I envied my friends who at least could go back to their old companies and get on with their old work. Little did I know at the time, we were all in the same boat, just that some chose not to speak about their uncertainty or fears. Doing the daily neighbourhood rounds. With Noah bundled up in the ergobaby during our our afternoon walks in the neighbourhood and my winter boots crunching on the gently-falling snow, wet hot tears would stream down my face. I’d cry as I ordered our bread from the Bäckerei for no apparent reason. I must have sounded like a bleating lamb.I thought only pregnant women and new mums cry – my kid was almost 16 months old! I’d stopped breastfeeding months ago! My hormones weren’t on overdrive, they were on speed, ecstasy and meth combined. The worst was catching a train. All of a sudden, there they were yet again: the warm drops on my cold face steaming up like the water in an Icelandic geothermal lagoon. The sense of uncertainty.The impending Eingewöhnung, a severe case of homesickness.Hating the bloody Berlin winter. Hating Berliners. Hating Berlin. I felt sorry for my fellow commuters who had to witness this scene. As I cried into my scarf, mascara running and staring out at the snow-frosted windows and with darkness setting in at 3:30pm,I wondered where the hell my life was going. I thought at the time that the best option to quell these feelings of lack of productivity (as though I was a machine in a Bangladeshi clothing factory) would be to join my French friend in her co-working space in Mitte. She is a hard-core economics journalist for a large French daily and was looking for a co-worker for a few months until she went on maternity leave for her second child. I thought this would be the best solution for me – I would feel productive, worthy. Professional. This turned out to be the worst decision – after starting the first month of a 3 month lease, I felt even more disillusioned than before. Here she was working so hard, doing interview after interview, writing stories. As for me, I was in the middle of Noah’s Eingewöhnung running between two opposite ends of Berlin on standby in case his childcare teacher called to tell me to pick him up immediately, and trying to simultaneously kick-start my “work” life when I felt so far from it. Deep down, I was exhausted emotionally with all the new changes going on in Noah’s new world. I could not concentrate. I wasn’t yet ready to plunge 40 hours a week into work. I don’t know what I was thinking. I wasn’t ready to share an office. I needed to be on my own for a while, to get my ideas and thoughts in some kind of order. Stop being the oldest-child- people – pleaser, I told myself. I don’t need to defend anything in front of anyone except myself. I told my friend that I would not be renewing beyond the 3 months lease.I had never felt so relieved. Out of all cities I could imagine living in, Berlin – that city brimming with hope, the possibility to fulfil your dreams and live those washed-out but real clichés where you are free to reinvent yourself every day in any guise, be it as entrepreneur, writer, artist or musician. Berlin- that city populated by Mamas and Papas wheeling their whaling babies in bugabooos and caressing them in African slings. Berlin- that city which gave me the time and space I needed. The time to adjust and to understand the whirlwind of changes.And the space to accept these changes. Berlin helped me realise that change is necessary and inevitable- to gain new experiences, new insights and new horizons. That those feelings of uncertainty about the future were/are still there and I don’t need to be so dramatic about it. That my goal to somehow “fix” this uncertainty during maternity leave was so misplaced. That the incredibly generous childcare scheme was a blessing to help me to get back to work, and not designed to incite guilt just because I did not know what was happening next. I could not imagine a more humane transition back to work in any other city. … part 2 coming soon. *Parent-run is a not-for-profit model of daycare where the parents are (obviously) not the teachers, they simply manage the day to day running of the place when repairs need doing and they hire teachers with representation of a parents Board. ** A cappuccino costs 1,80€ at my local café with an award-winning barista. A 2 hour round ticket for unlimited travel on bus, tram and train is 2,60€ .Average monthly rent is around 600€ for a small 1 bedroom apartment (60 sq.m)with a small kitchen, one bathroom and a small loungeroom.